Day and night fishing, breathtaking views of a sunrise over Charanchua bay, through the palm trees of a private park. This home has a unique view of the bay with no other homes blocking the view. NO WORRIES while your boat is protected from waves safely at the canal dock in front of your house. Fish from the dock for Redfish or trout swirling around the underwater lights at night right in front of the house. Let the kids fish while the adults enjoy the cool evening breezes in eyeshot of them, from the upper or lower patio deck. Nap in the shaded oversized hammock. Quiet surroundings, boat ramp access. Charancua and Keller Bays are close by. Boat out to 'The Point' for a deserted sand beach experience of fishing or hunting seashells. Spend the day skiing or swimming in the bay. Dolphins frequent the bay and the canals in front of the house. 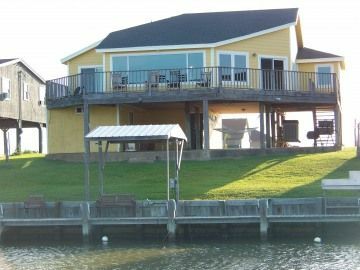 15 minutes from town for shopping, dining, Port Lavaca beach area and a Super Walmart. Tracy and I have been married for over 26 yrs and have been coming to this area all of our life. having a teenager involved in sports and school activities has kept us involved and away from the bay as often as we would like. We therefore decided to share our home with friends and folks that would enjoy the coastal water as much as we do. This house has an open concept living area great for gathering your friends and family. It also has over sized windows to view the water and bay. The window are hurricane impact resistant which makes them quiet and energy efficient. this helps keep the Air Conditioning working well on those hotter than normal days. With Three large bedrooms, there is room for privacy and room to sleep everyone. Being on first canal facing the bay, the dock has protection from the waves and wind at water level. This is beneficial you plan to bring boats, kayaks or Jetskis with you. They will be well protected from the harsh waves or strong wind. Also the twin underwater fishing lights are unique to us. The red fish and trout swirl in the light at night to feed on the bait. Fish all day and night! I've been to over 20+ countries but its nothing like the "USA" and in my back yard close to my hometown Port Lavaca. I wish I could keep this "secret pearl" to myself and I hope to be able to continue to make this my home away from home. Truly memorable senic time with family. Great relaxing place, just bring your clothes, and food. Neighbors friendly. Wonderful sunset and great fishing. Our family stayed here for 2 nights and everyone loved it. Nice open floor plan with gorgeous views! Most of our time was spend outside fishing off the pier and hanging out on the patio. It was nice being able to watch everyone fish while hanging out on the deck or patio areas. Russ was very nice and helpful with any questions we had during our stay. Text and calls were responded to very promptly.